This is one of my favourite maternity sessions that I have photographed to date. I met up with Alicia and Andrew and Bowness Park. Bowness Park is a gorgeous location that has so much variety including lovely trees, grassy areas, the Bow River and the lagoon. Alicia and Andrew are such a fun couple who love nature so this location was perfect. Bowness Park makes you feel like you are in the wilderness while you are really close to home. 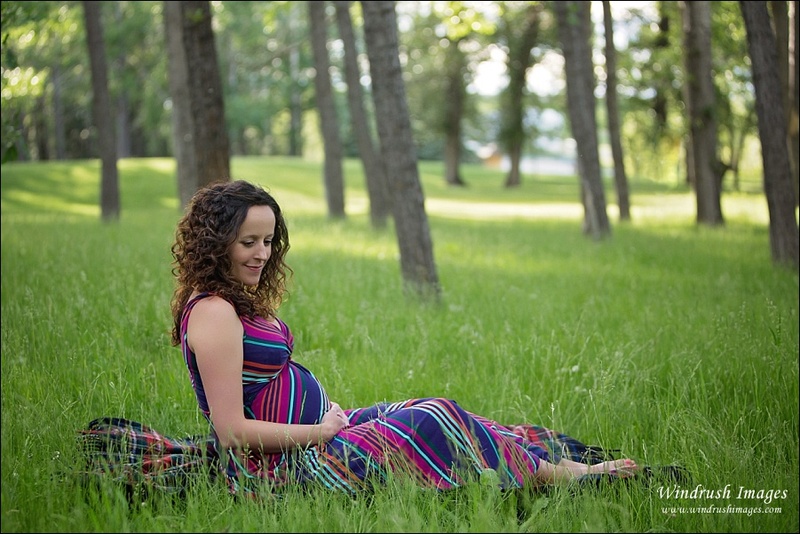 We spent a relaxing evening walking around the park and capturing some beautiful maternity photos. As always, the weather in Calgary was unpredicatble on the day of the pregnancy photo shoot. As I was waiting for them to arrive the wind was really whipping around. Luckily, just as they arrived the sun came out and the light for the photos was perfect. I especially love the photos we captured of Alicia and Andrew together as the sun began to set down by the river. You can really see what a beautiful connection they have and how excited they are to meet their baby! Interested in booking a maternity photography session? I'd love to chat to help you book a photo shoot or answer any questions. Contact me! More of my pregnancy/maternity photography can be seen here.